New Gallium Nitride (GaN) solid state technology amplifiers allow for significant power consumption and size savings vs. widely used Gallium Arsenide (GaAs) technology amplifiers without any compromise in RF performances or reliability. 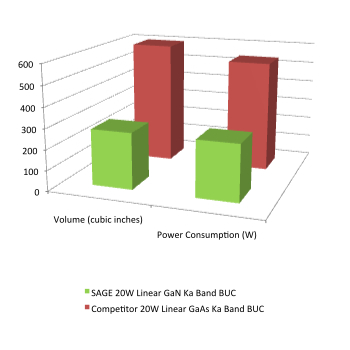 As an example of efficiency gains with GaN technology, SAGE SatCom’s Linear Ka Band GaN-based Solid State Block Up Converters consume 50% of the power and are 50% of the size of comparative performance 20W Linear Ka Band GaAs-based Block Up Converters. 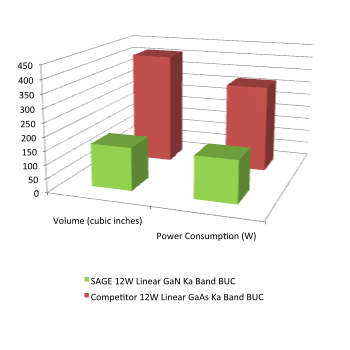 With power consumption being the main driver of Block Up Converter operating costs, the reduced power consumption of SAGE SatCom’s Ka Band GaN-based Block Up Converters provide OPEX savings of up to 50% vs. GaAs-based Block Up Converters. The greatly reduced size offered by SAGE SatCom’s GaN-based technology allows high power output Ka­ Band Block Up Converters to be used in portable solutions such Man-pack, Mobile, and SatCom­ on-the-move applications. SAGE SatCom’s Ka Band GaN-based Solid State Block Up Converters consume 50% of the power and are 50% of the size of comparative performance Ka Band GaAs-based Block Up Converters.